With less than a month before the midterm elections, endangered Republican lawmakers are mounting a defense against attacks they’re trying to dismantle a core element of the health-care law they fought to eliminate. Democratic candidates on the campaign trail now regularly accuse Republicans of wanting to take away health-care protections for people with preexisting conditions. They’ve pointed to a lawsuit brought by 20 attorneys general in Republican-led states aiming to overturn the Affordable Care Act as proof the GOP wants to let such protections go down with the health-care law. That’s after Republicans whiffed in their effort to repeal and replace the ACA last summer. Large majorities of Americans say it is “very important” to retain the ACA provisions that prevent insurance companies from denying coverage based on a person’s medical history (75%) and from charging sick people more (72%). This includes majorities of Democrats, independents and Republicans, as well as majorities of those with and without people with pre-existing conditions in their households. On Wednesday, the U.S. Senate took a vote on a measure that sought to get rid of Trump administration efforts to expand short-term health insurance plans (which are often called “junk insurance”) that are intended to kill the ACA, and thus, protections for pre-existing conditions. Senator Michael Bennet (D-Denver) voted “YES,” and Sen. Cory Gardner (R-Yuma) was a big fat “NO.” Republican Senator Susan Collins of Maine voted along with Democrats, but that wasn’t enough to change a 50-50 tie in the Senate. In political terms, this means that you can call Gardner a deciding vote. In August, Treasury Sec. Steve Mnuchin, Labor Sec. Alexander Acosta and Health and Human Services Sec. Eric Hagan issued a rule expanding the duration of these insurance plans that do not comply with Affordable Care Act requirements. The 2010 ACA law allowed the sale of short-term insurance plans to serve as a stop-gap between long-term plans. The Trump Administration’s rule allows those plans to be extended as long as three years. The plans are cheaper than long-term plans but do not offer the same level of coverage as plans that comply with the ACA; prescription drugs, pre-existing conditions, pregnancy and mental health coverage are not required to be covered in these short-term plans. You didn’t seriously believe me, did you? Gardner was also asked about what he would do about those people who are worried about losing health care coverage with pre-existing conditions if the Affordable Care Act is repealed and replaced. 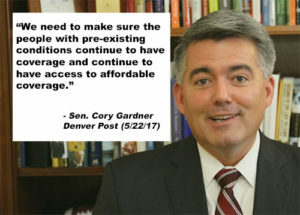 Gardner said he is pushing for affordability to make sure insurance is accessible to people with pre-existing conditions. It was just last April, in fact, when Gardner declared that the Senate “can’t just walk away on healthcare.” Yesterday, Gardner voted along with most Republicans to go ahead and walk away on healthcare. 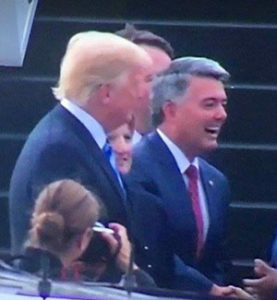 Cory Gardner is up for re-election in 2020. Actually the Republicans do have a health care plan that covers all existing preconditions and all people. It's called the Don't Get Sick Plan. Because if you have the Right Lifestyle™– with a spouse, a church, a gun and your InfoWars-approved nutraceuticals–you won’t get sick. The Republican-approved perfect health cocktail is guaranteed to repel all cancer cells and coronary artery cloggers with a bodacious blast of oxytocin and serotonin! And you can keep that nasty cortisol at bay by only associating with your own political kind. Remember, mingling with otherkind = stress = eeebil cortisol = shortened life. Don’t you want to live to 100?! Yeah. Take it from Alex Jones. A guy in his mid-forties who looks about 10 years older and, at times, a heart-attack away from keeling over. He was probably undecided right up until the actual vote. It was a tough call for consider all the angles Cory.